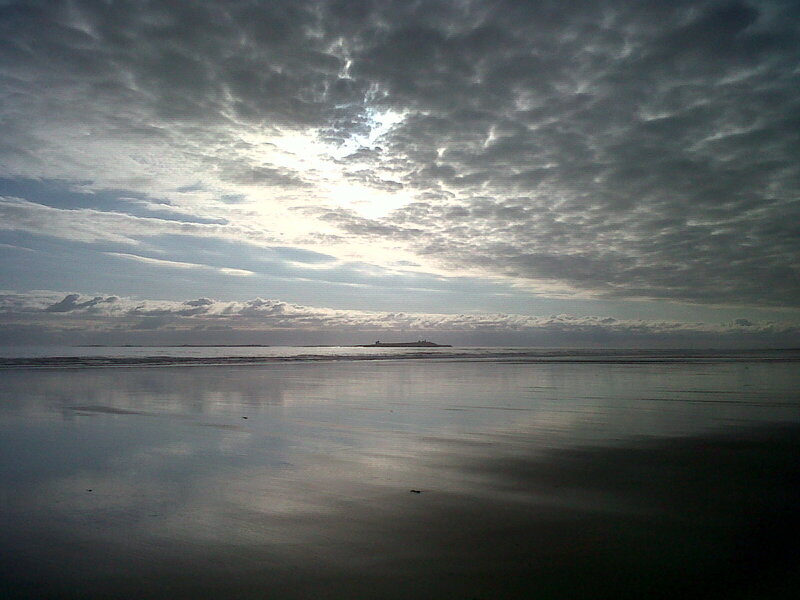 Peace and tranquility reigned very early yesterday morning on Bamburgh Beach, as we gazed out towards Inner Farne. We appreciate the privilege of putting our paws on the sand before anyone else; later in the day when the temperature reached an unlikely 84 Fahrenheit, the place was transformed and not for us. We have never known the area so busy, despite the fact that there’s a month to go before the schools break up for the summer. Out on the islands, wildlife is bustling hither and yon: the now-famous Bridled Tern is still in residence, offering his charming profile for keen photographers who have come from all over the country to admire him. Guillemot babies, known as ‘jumplings’, as yet unable to fly, are busy throwing themselves into the sea by way of a first foray-forth. Puffins are everywhere, smiling broadly and flapping wildly as they fly over the boat trips. This afternoon once the sky had darkened and wind arisen, in fairly choppy water over rocks near the shore, we saw a mother Eider duck bobbing up and down with two little ducklings. As buoyant as corks, they bravely negotiated the waves, keeping close to their attentive mother, though theirs was a worrying kind of independence. The Mantalinis visit most days, but as yet we have seen no little ones; by contrast, generation upon generation of thrushes, robins, wood pigeons, sparrows and starlings several times a day muscle their way on to the feeders and bird tables, mothers and fathers sharing their precious little ones with us as they all snaffle up the seed. Up on the roof, Peter, Paul and Mary are becoming more Falstaffian in girth by the day: amazing what nourishment is to be found in crab legs and cold chips! Relative darkness having prematurely fallen and a brisk wind darting drops of rain on the newly-watered garden, the triplets are currently a-bed, watched over by the parent on duty on that charming cowl no matter what time of night or day. Perhaps tomorrow will afford a jollier shot of our favourite family. Most of the roofs round here have their share of guano, courtesy of their respective resident gulls. 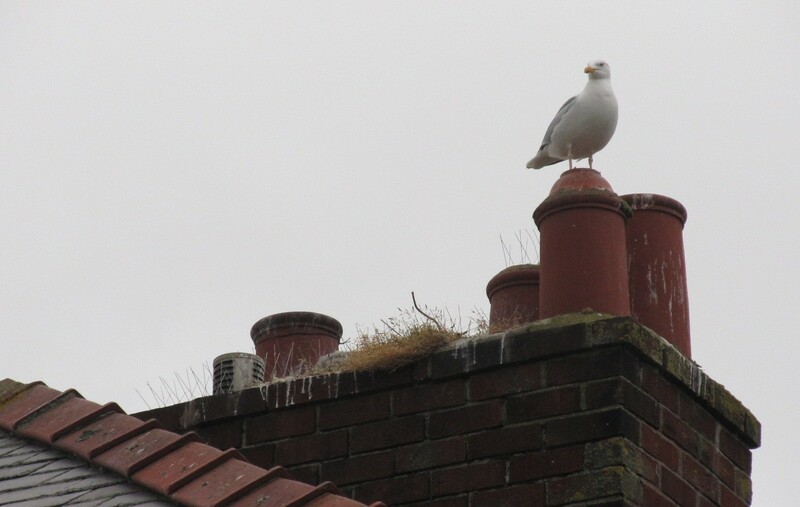 Some try dissuading the birds with spikes but we are all thrilled that the gulls are unimpressed by such hostility. One of our chimneys, as every year, has jackdaws nesting within it (which can bring its own problems) but we enjoy the cackling of these little crows and knowing that their little ones will eventually join us in the garden we are thrilled to share with them. Yes, the window-cleaner cannot come too regularly at the moment, and the garden seats need washing nearly every day, but what a sad, clean world it would be without the swooping and whooping which characterises our lovely feathery brethren. There’s been much discussion in the British press this week about the damage being done by bats, who are protected, to the historic churches where they often live. Their droppings cover the floor and furniture, their urine scorches monuments and fabrics; the discovery of their very presence halts vital preservation work. 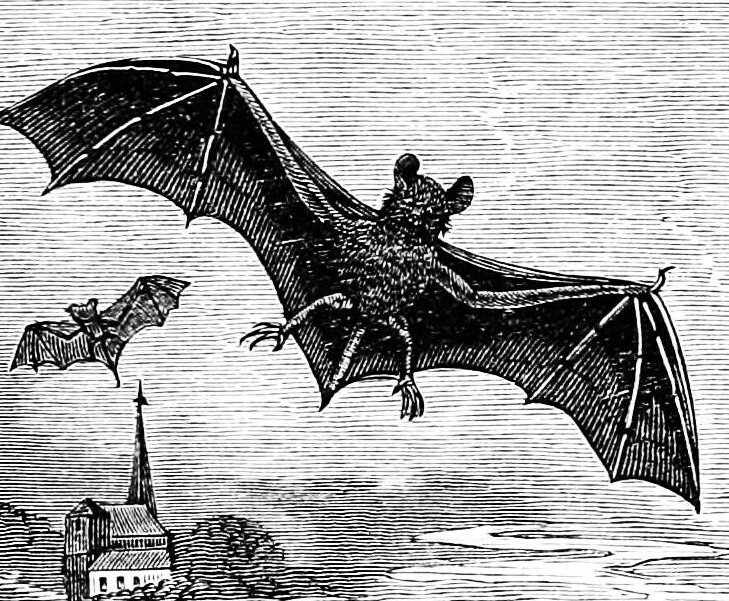 Restorers and bat lovers are at war. It is ironic that these sweet little creatures, for whom we all have especially warm feelings as we watch them darting about as dusk falls every evening, should be so populous in buildings that humanity has, for the most part, abandoned, other than for academic interest. Surely, the Great Spirit welcomes them; perhaps they ponder, as do I, on the terrible destruction wrought in those very churches centuries ago and how much of beauty and significance was lost for ever because of the vanity of man, not because of the innocence of the tiny flying mouse.